While I love trying out new makeup products, I also think it’s important to make sure my skin stays healthy. 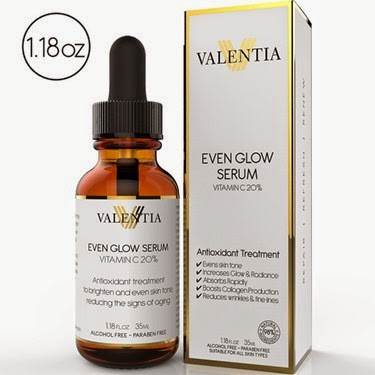 So of course, when I was asked to review Even Glow Serum from Valentia, I was excited for the opportunity. SUPERIOR INGREDIENTS INCLUDE: Organic Rosehip Oil, Organic Sea Buckthorn Oil, Green Tea Extract, Botanical Hyaluronic Acid, and Resistem (Plant Stem Cells). All ingredients chosen for their ability to enhance Vitamin C efficacy on your skin. EVENS SKIN TONE | INCREASES GLOW & RADIANCE: Vanquish dark spots and revitalize your skin with this new generation Vitamin C serum along with essential fatty acids that leave skin smooth and visibly brighter. Smooth skin capable of reflecting light will give your skin a youthful glow and a brilliant shine for that well-rested and refreshed look. LUXURIOUS SMELL + ALL DAY HYDRATION – Experience the most addictive Vitamin C Serum on the market today. Non-Watery texture allows for greater coverage with less serum, deeply penetrating and reducing pores by locking in moisture. REDUCES WRINKLES & FINE LINES: Special ingredients like Hyaluronic Acid and Organic Sea Buckthorn oil work to plump up the skin, reducing wrinkles leaving skin clearer and younger. BOOSTS COLLAGEN PRODUCTION: The presence of Organic Rosehip Oil and a foundation of 20% Vitamin C increases collagen production so your skin retains the elasticity responsible for a youthful appearance and prevents skin sagging associated with aging. Enjoy smooth and supple skin that takes years off your appearance. The bottle that the serum comes in is small, but a little goes a long way, with one dropper being enough to smooth over my face and neck. The smell of this product is amazing – it is very fruity smelling. I have not been using the product long enough to see long term results, but I already love the feeling of applying it after my shower. I like that it does not need to be washed off or dried and it absorbs quickly into my skin. When you order this product on Amazon, you also receive a PDF file called “Age Defying Facial Treatments” which contains instructions for a variety of facial toners, cleansers, exfoliators, and moisturizers, which was a nice added benefit to the serum itself. I am enjoying keeping my skin healthy with this serum!